i just happened to stumble upon this page on Sikh prophecies on a nihang website...i m posting it here for everyone to read and express their views on it. The Karni Namah and the Raj Namah are two significant chapters of the Sau Sakhi, the Sikh book of prophecy. The Raj Namah appears in, The History Of The Sikhs, by J D Cunningham on p. 340. Cunningham came across this document during the mid 19th century. He states that these ?compositions are of course fabulous as regards Nanak, and appear to be the compositions of the commencement or middle of the last century?. The Karni Namah was told to Qazi Rukan Din, Pir Bahaoud Din, Ghous, Kuthab, Saalaar, Hajji, Sheikh and Mushaikh Aulviya, who sat with Guru Nanak at religious discussions. The Raj Namah was told to Kaarun, the Emperor of Rome, on Guru Nanak?s return from medina. These prophecies were in the Old Janam Sakhi?s written by Bhai Bala, who accompanied Guru Nanak on his travels. However, the British removed them. ?Raaj Karega Khalsa Aaki Rahai Na Koe. Khuaar Hoe Sab Milengai Bachai Sharan Jo Hoe?. This is said by the Sikhs in their daily Ardas. As it can be seen, the Karni Nama is the only source of these words. While Guru Nanak was in Mecca and Medina, Qazi Rukan Din asked, ?True King, tell us your prophecy again. Tell us how you will unfold the future?. of the Lord. What are the instructions for the future? Nanak replied Rukan Din, ?listen to the true answer? Whosoever reads or listens to this shall be content. All doubts shall be removed. In the tenth dress shall reside The Lord. I shall fight many battles against Emperor Aurangzeb. I shall then send a letter of victory (Zafarnamah) to Aurangzeb with my Singh (Bhai Daya Singh). Upon seeing him, Power shall lessen and he shall forget his devious ways. Emperor Aurangzeb will be overwhelmed by the sight of Daya Singh and will start to tremble. ?The Khalsa been resurrected! Good has not been done by Gobind Singh!? There will be a time when the Khalsa shall forget the teachings I have given them. Sikhi will only be left in name. Many Wars shall occur. I will have to return again to resurrect the Khalsa. They shall reside in the Punjab. I shall make people from all four corners into one. They will be in Majjha; They will raid Lahore. They will bring Potohaar to justice; They will take Peshawar. They will set up a cantonment at Attock and then open the Khyber Pass. They will establish a kingdom in Kabul and then take Ghazni. After bringing Hazaara to justice they will march on to Kandahar. After taking Balack and Buckaara, they will conquer Sindh and Baloch. After gaining victory over these lands they shall govern all the people. Mecca, Medina and Rome shall tremble. They shall gain victory in battle over south and west India. The Guru?s Army shall sit at the throne of Delhi. Umbrellas of kingship shall sway over their heads. All shall be content. From East to West all shall be conquered. None shall challenge the Khalsa. All humanity shall become one. In the kingdom of the True King, Satjug shall be established. arrows of death shall not touch them. The Army of the Timeless shall grow and spread like locusts. All shall wear vestments of blue; no one else shall be seen. Listen Qazi Rukan Din, ?The Singhs shall rule?. The Unholy Sheikhs shall be destroyed. Pirs and Mureeds shall be no more. All shall recite the one name of the Lord. Then he shall come himself. The untrue shall not be able to see his glory. All humanity shall unite and he will distribute provinces. The Earth shall give food and the mountains shall give diamonds. Fruits of many kinds there shall be, upon the sight of the timeless. All shall recite VAHEGURU and achieve salvation. Many Dharamsalas (places of discussion) shall exist. The Koran and the Mosques shall vanish. The Lord shall manifest himself in body (as man). He will make all utter VAHEGURU. All Singhs shall flock under his banner. All shall know him as the True One. He will sit at the throne of Delhi. He will establish a kingdom of peace and no enemies will remain. Wherever the Khalsa turns his eye, the 14 realms shall tremble. For 14,000 years, this kingdom shall remain. Wealth will be collected and food shall be distributed. The naked and the starving shall all receive; no one will go without. Sayeth Nanak, ?Rukan Din, This is how it shall be?. Whosoever reads the Karni Namah, his love with The Lord shall grow. The Word of the Timeless shall prevail. Those uttering falsehood shall not remain. After the effect of The Akaal, forests, mountains and the world shall see salvation. The Khalsa shall Rule. There will be no-one left to oppose them. Kaarun, he made his disciple. But when wilt thou return? Then shall men exclaim ?Vaheguru? The five weapons shall be worn by all. The name of the Khalsa shall be everywhere. The wondrous Khalsa shall arise. And fighting shall follow year after year. They shall place the name of Gobind Singh in their hearts. The Empire of the Khalsa shall prevail. Then the west shall bow to them. Kabul and Kandahar shall lie low. Arabia shall be conquered and they shall march on to Mecca. And Medina shall be seized. And all shall exclaim ?Vaheguru?. 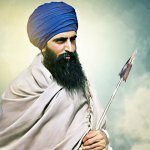 The holy Khalsa shall be exalted. Beasts and Birds shall tremble in the presence of the Lord. Men and Women shall everywhere call on God. The Earth, the Oceans and the Heavens shall call on God. By calling on the Guru shall men be blessed. No other religion will remain. Which Nanak received from the Lord. Nanak, the slave, cannot comprehend the ways of the Lord. Thus replied Nanak to Kaarun?s question. The coming of Nanak was prophesised thousands of years before his arrival. These prophecies are explicitly detailed in the Vedas and the Puranas, which are amongst the oldest scriptures on Earth. Whilst at Mecca and Medina, Guru Nanak unfolded futuristic events in the Karni Nama and the Raj Nama. He clearly states that he will have to return to ressurect the Khalsa. Prophets of the world have all established their religions. Each religion was a requirement of its age, which the prophet was sent to fulfil. The way of the Khalsa is the requirement in the age of Kaljug. It is the tool necessary to defeat Kaljug and establish the kingdom of Satjug. Presently, the Khalsa appears to be in a state of dormancy. What is required for the Great Guru to show himself? What conditions are required, i.e., how much more of a decline of humanity is required? Is this decline necessary? What can we do, as Khalsa, to stop this decline from occurring? What we are currently doing is OBVIOUSLY not working!!! WELL OBVIOUSLY IF THE SAUH SAKHIS ARE WRRITEN PRIOR TO GURU GOBIND SINGH JI MAHARAJ, AS STATED IN THE TIME OF DHUN DHUN SIRI GURU NANAK DEV JI MAHARAJ SATGUROOO, they are true as they talk about arugnazaib etc. and what the khalsa is doing wrong? its doin ntn wrong, but ntn rite either thas' the problem, khalsa is doing nothing rite now, its as dead as a slug with salt. Well personally first when I read it i'm like :oo: that makes sense, with satjug and everything. But then I don't know it sounds like a fiction story. Like I agree with Gabroo Khalistan Daa, khalsa is doing nothing bad, but also nothing good at the moment, as a whole. I guess if a leader emerges within Sikhi, then maybe we can progress, and that's all upto the almighty-Waheguru!! I find this "Prophecy" to be a bit shady. First off Sikhi teaches us that Whaeguru will never manifest into human form, so this story conflicts with bani right off. Also it says that Guru Maharaj Ji said he wil return when Sikh begins to decline, and the Khalsa will take over Northern Hindustan referring to the Khalsa Raj Under Ranjit Singh. So according to this Guru Ji returned as Ranjit Singh?!? I find that hard to believe. Also this story tells us that "non-believers" will be killed, which I beleive is something our Guru NEVER taught us to believe in. That statement sounds more like a Islamic quote, rather than a spirtual Sikhi one. If I have said anything wrong please forgive me as I am a child among such Gursikhs as yourselves. Guru Gobind Singh was travelling through a district of East Punjab. His next stop was a village, Soheva, where he camped for a night. Beside Guru Gobind Singh's tent was a large Jand tree. He told a Sikh to climb up the tree and look for a Pipal (Brahminic Fig) sapling within the Jand tree. He found it in the cleft of the Jand tree. society, which will last for five thousand years. That divine society will enjoy peace and affluence." Queen Victoria on reading this, knowing there was something mystical behind the invincibility of the Sikh soldiers wrote to the Governor-General at Calcutta, "Please go and find out the village Soheva, and see if there is a Pipal tree growing in a Jand tree. Please report the size of Pipal and Jand tree." The reply came in two or three months, "Yes, it is there. It is about four and half yards and the Jand tree is such a height. The she referred the matter to the Royal Botanical Professor, who informed her, "Your Majesty, the Pipal trees grows very slowly and it will take the Pipal saplings at least one hundred years to grow to the height." Her Majesty's mind was at rest and she slept without any mental disturbance that night because as far as she is concerned, one hundred years of uninterrupted British rule in India, guaranteed by the slow rate of growth of Pipal tree. Note: Soheva is a village in the old Bikaner state, which is now part of Rajasthan. Its Tehsil is Rini and district is Churu. It is situated at 25 kos from Rajgarh station and 30 kos from Sirsa. The people often called it "Saha". During those days I was a British Officer in one of the districts of the Punjab - about sixty miles from Soheva. I was aware of this story and the official report sent from India in 1858. In 1942 I made arrangements to travel on horseback to see this tree. It was about two and half yards lower than the highrest pinnacle of the Jand tree. Since 1942 I have not been there, but now I am told that the Sikhs who were expelled from Pakistan areas have settled in those arid areas and have raised in that place a magnificent Gurdwara. The late Kapur Singh passed away in 1986.
visible Jand in the outgrown Pipal tree. During my discussion with the sadhu, I found a number of interesting things. He told me, "There still exists a small branch of JAnd about nine inches in size. It will be eaten up by the Pipal tree by the turn of the century. The 300th anniversary of the birth of the Khalsa in 1999 will be the turning point in the Sikh destiny. i agree with Tru khalistani..
plus Guru ji said.. whereever there is Panj Pyaree.. there is Guru..
No Veera, it says when sikhi is left only in name, referring to Ranjit Singhs reign. I refuse to accept this "prophecy" for this statement among others as well. Also why would Guru Ji return in human form? He left us with the instrucions of following Guru Granth Sahib as our eternal Guru. Why is it that many insist that the Guru "will return", when our Guru is already with us, is it that these people refuse to accept Guru Granth Sahib? Our Guru is already here so there is no coming back of the Guru since, "Bani Guru, Guru hai Bani" remember this and stay the course. The above texts are not accepted by everyone as authentic texts. They seem to be at opposite with Sikhism's "Sarbat Da Bhala" concept. Nut nothing can be said for sure. Other things at the site are also a little strange. Unfortunately, Sikhism's scholar structure is not at all organized or uniform to present clear views on many things. Hopefully, Sikhism will have a solution to this problem soon!!! Im so confused!! Can someone break down both texts?? Thanks!! in every jug a great prophet/massiah comes sent by akal purakh himself. In this jug it was guru nanak, sent to save us from kaljug. In previous jugs it is unkown as our history does not go back that far, but it is a safe bet that the vedas, puranas, etc are all relics of the religions of previous jugs (Which are outdated in this jug) and they are misunderstood (ie hinduism). In the next jug khalsa (ie pure ones will rule) under the prophet of satjug. This is most likely why guru sahib said he would return and most likely the translation/interpretation could be off, ie guru granth sahib jee says know that the guru and akal purakh are one, so perhaps this guru/messiah of satjug is such that he is sent directly by guru sahib etc..
or i could be totally wrong and have no idea what im talking about (Which is more likely). I think calling me 'it' is rather rude. Not the best way to treat a guest who comes in peace. Your understanding of Christianity is very inaccurate. Never mind. You are a Sikh and i respect that. I am here to know about your religion not to try to explain mine. In terms of the essence of our religions, i think there is some common ground. Your gurus and our Christ taught many wise things to correct human behavior. I don't wish to argue. Rather focus on positives of which there are plenty. Cultures should live peacefully alongside. Why do you feel so threatened by me? Surely you are confident in your own beliefs? I am. Unshakable.